Most Cubs fans will tell you they’ve been waiting their entire life for a World Series victory — but just about no one has been waiting as long as a certain Cubs fan in New Hampshire. Hazel Nilson is 108 years old, and might be one of the world’s oldest sports fans. It’s always been about the Cubs for Nilson — who grew up within walking distance of Wrigley Field. “I love baseball,” she said. She was a Cubs fan when she bought her first car for $28 dollars, a Cubs fan when she went off to school and a Cubs fan when she got her first job as a physical education teacher during the Great Depression. Through it all, this Cubs fan never witnessed a world championship. She was asked how it would feel if the Cubs manage to win their decisive Game 7 against the Cleveland Indians on Wednesday. Nilson is convinced this is the year and believes her age proves it. The Cubs last World Series win was 108 years ago, and there are 108 double stitches on every baseball, a stitch for every year she’s waited, and there are no more stitches to count. Hazel’s neighbors are throwing her a watch party tonight for Game 7. They’ve also reached out to the Chicago Cubs organization suggesting that if they win, some players bring the World Series trophy to New Hampshire so Hazel can see it in person. She says it’s on her bucket list. Nilson isn't the only 108-year-old pulling for the Chicago's Loveable Losers. But Mabel Ball, of Chicago suburb Northbrook, only managed to go to one game at Wrigley Field — when she was 90 years old, as a birthday treat from her kids, according to the Chicago Tribune. Grizzly bears at the Cleveland Zoo have predicted the winner of the World Series. Two grizzly bears were presented with two pumpkins coated in jam. One pumpkin for the Cleveland Indians, the other for the Chicago Cubs. 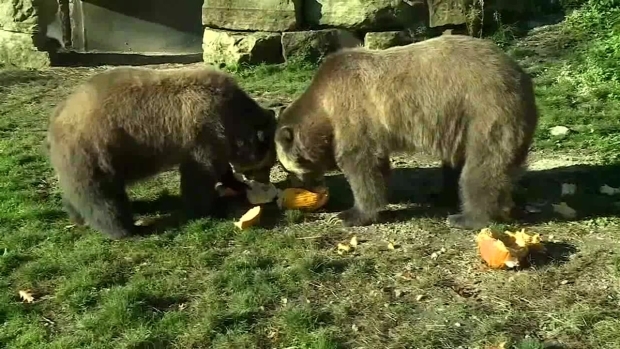 In the end both grizzlies chowed down on the same pumpkin choosing the Cleveland Indians to win. Why? "I was busy," she told the newspaper last week.